When you’re heading to the bank to make deposits on a regular basis, you want it to be as easy as possible. 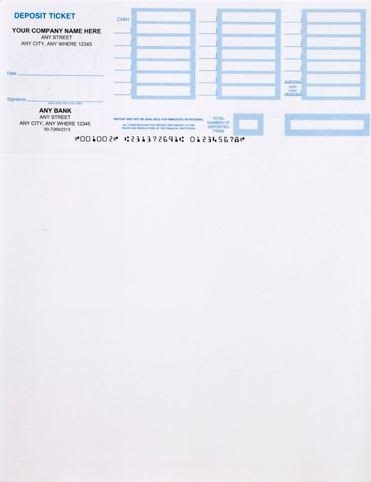 These printable deposit slips streamline the entire process. Compatible with Quickbooks and Peachtree, these printable deposit slips can come in one, two, or three parts to provide you with the copies of each slip that you need for your own records. They meet or exceed your bank’s standards for MICR codeline quality and are guaranteed Image Character Recognition compatible. Please keep in mind that if this is your first order, you will need to send in a copy of your deposit slip to ensure that all of the information is correct.